UPDATE: The Candlelight Ceremony and Processional sweepstakes is open for Disneyland Resort Annual Passholders now until November 18. Click here to enter. The start of Holidays at the Disneyland Resort is just one week away! 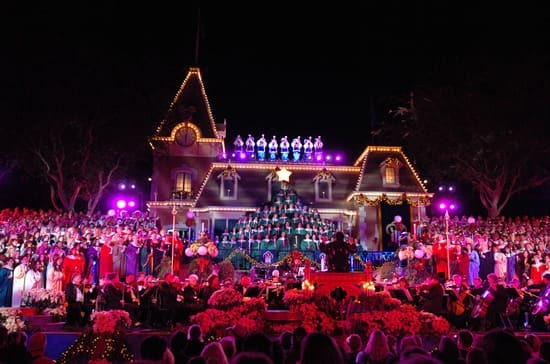 And I’m excited to share information about how Annual Passholders may get a chance to view the 2012 Candlelight Ceremony and Processional at Disneyland park. Beginning November 12, Disneyland Resort Annual Passholders can learn the full details about the Candlelight Ceremony and Processional sweepstakes, and be able to enter online for an opportunity to view a performance. Until then, please visit this page for details about the event, and this page for a list of 2012 Disneyland Candlelight Ceremony narrators. Dining packages will not be offered this year. Keep in mind that you can still call the Disney Dine Line (714-781-DINE) or email dine@disneyland.com to request reservations for Disneyland Resort restaurants throughout the holiday season. Information and event subject to availability, restrictions, change and cancellation without notice. If you didn’t get a ticket, is there any other way you can get a seat for the Candlelight Processional? Is there a place to get “un-used” tickets? Erin, I still have not received a response about whether or not my entry has been accepted. My boyfriend got a response saying his was rejected and he entered after I did. Do I assume I was not accepted? When should I know by? Erin – I am hoping you can provide clarification for me. My husband and I (both annual passholders) both entered the sweepstakes; he was selected to attend (Yay!!) and I was not; however, due to other commitments, he is not sure that he will be able to attend (we will have to travel from Las Vegas to attend that weekend), but, I will DEFINITELY attend, without question! So, my question is: If I have his annual pass with me, along with the confirmation email, which is in his name, not mine, will I be able to attend the processional without him? Or, does he have to attend, since his name is on the email? I look forward to your reply. Thanks for your help! We are still coming out, but very disappointed that there are no opportunities for the dining package seating. I for one think it is a wonderful idea of Disney to open this up for annual pass holders. The perks of being a pass holder are becoming fewer and fewer and I appreciate it. Thanks Disney!!!! I think it’s fantastic that the Park decided to do this for the passholders, as they really didn’t have to do it. If you’re a passholder, and you plan your visit to the Park on one of the nights, you get to see the whole thing anyway. What’s nice about this is that the shows been extended, offered twice a night and that all the A/P’s who enter have the same chance to be picked. Just like the opportunity to see Star Tours (and no dinner package is just fine as there are so many good places to grab a bite to eat). Still waiting to see if I’m one of the lucky ones. If not, I’ll still go to see the show. Wouldn’t be the Christmas holidays without it. I go every year and never have had seats. You dont have to have one. You can see the whole thing just like the fireworks show. Have fun and just go it is very magical and has alwas been the best way to start christmas in our family. Can I just buy tickets to see this or do I have to win the sweepstakes? I’d really like to go & wouldn’t mind paying for tickets. I am a pssport holder and cannot find the page to sign up for the lottery for the candlelight procession? Any ideas? I think those that are upset about this should remember that this event is about the reading of the CHRISTmas Story, and thank Disneyland that they are giving so many more people a chance to see it and not charge extra. If I get a seat or if I have to stand, we will do what we have to do, even if far away it will be magical and a blessing. I and my family have numerous health issues and standing is hard for a long period but this is a once a year event and we will do our best to get to at least hear it. It is a blessing in this world where we don’t get to see events like these for Disneyland to host them. I hope to see all of you there and God bless!! I remember quite a few years ago they had it back in the Fantasia Theater which work out nicely. There has been a lot of work going on there lately. Could it be possible that they are going to have it back there again? I couldn’t imagine Main Street being blocked off like that twice in an evening. <<>>> What are you guys up to? How do you register for the sweepstakes? It’s not very clear on this website. I’ve been trying to find it for over a half hour. Please post!!! Does anyone know if babies are allowed at this event? I’ve got a ten month old and we were hoping to attend as a family this year but I’ve read the “sweepstakes” post a few times now and am still kinda unsure. It seems to imply that all guests need to be 3 or older but I’m not sure if that’s just a “registered guest” or not. Does she need to be a registered guest if she’s not using a chair? So confused! Thanks in advance. Susan, yes there is a designated w/c area, however anyone with a handicapped person does not get a chair. I would love to be able to win 3 seats for the second viewing of this awesome and moving event. My 2 other friends and I really owuld love to be able to have a seat to be able to see it.. I first encountered this event a number of years ago in my teens. I will never forget that night because the Fabulous James Earl Jones was reading the Christmas Story.. Come On Darth Vader reading the story.. Gotta Love it!!!!! I am truly hoping that my friends and I are mong the fortunate ones to have a seat..
AP passholder or not, does anyone know if there is a designated section for those in wheelchairs? Hi Erin! I, for one, am excited about this opportunity. If I get a seat, AWESOME; if not, at least I tried. In any case, therein lies my problem. My AP expries later on this month – sometime between 11/12, when I’m assuming the sweepstakes begins, and the first Candelight Ceremony and Processional. Because I won’t be renewing until 11/21 (give or take a day), will I be eligible to enter the sweepstakes b/c techically, although my pass will be valid at the time the sweepstakes begins, my pass will be expiring before December? Please say yes! I will be renewing for sure, just want to make sure the “system” recognizes me as having a valid AP although it technically expires on 11/21. Thank you! If I don’t win an AP seat, it’s good to know I can at least stand on the ‘side-line’ as it were to see the ceremony. Thanks for the update, Erin. We have been planning this trip for months. We had planned on attending the Candlelight Processional before it was announced to be twenty nights. But once it was extended and announced that there would be dining packages, my in-laws decided to come along. Now, I’m disappointed that there are no dining packages that I looking forward to purchasing; if I was never told there would be, then I wouldn’t be suffering this disappointment. Now I don’t know what to do about my in-laws. They are not handicapped, but they are not able to be standing beforehand waiting at a spot and then wait more during the show. I was worried about them making it through the parks, but at least they could sit down if they needed a break. If we need to stand for an hour I think we’ll have to leave them and tell them that the show that pushed them to go is no longer available for them. When I first started planning my trip for this holiday season I’d heard about this event & thought that I’d just be standing to watch, and it would only be Dec 1st & 2nd. I was thrilled to hear that it would be showing each night of my stay, and while I will admit that I was very excited about getting seats as an AP holder (I live in Canada & decided to buy one as soon as I saw the blog update that the prices were going up), if I do get seats that will be a bonus. I’m hoping I will be able to enter the draw, but given that entry is online, I suspect I won’t be eligible (despite Disney having my money for 6 months already), as I cannot activate my annual pass until I arrive at the park for my visit on Dec 1st. Erin, I wonder if you can address that possibility? Regardless of whether I get in the draw and/or win or not, I will thoroughly enjoy my holiday visit to the parks – haven’t been during the Holidays before, and I haven’t seen Cars Land or Buena Vista Street either, so there is too much to look forward to to worry about whether I get to sit or stand to view this show! I understand people’s disappointment about the dining packages; that was poor announce that there would be dining packages & then not offer them (NOT your fault Erin, I fully understand that), but let’s all just wait and see what information comes out on Nov 12th. It makes sense to me that you’d be able to enter the draw for dates that you are able to attend… Especially for out of state/country pass holders, so I’m optimistic that I’ll be able to only enter for tickets for the days I am there, assuming I can enter at all. In any case, Happy Holidays everyone! 🙂 Can’t wait to see you Mickey! YAY!! Finally some news! Good Luck to me!! I agree with the disappointment of not having an assured seat but my husband and I have been fortunate enough to have received seats about 3 times in the last 8 years or so, even when they cancelled it due to rain in 2010. We start standing in line during the first viewing of the night for the second viewing. It is a long wait, but it assures you the opportunity to get a good standing view and then if you are close enough and there are empty seats due to no-shows, the ushers will pull a select few and offer them the empty seats. I agree it would definitely be much much easier and a lot less of a hassle to know you had comfortable seats without the guessing game, but at least it isn’t impossible to view a performance, even if you have to stand. I for one have never been so happy to get an announcement that more information is coming. Can’t wait to hear ow it all works. SO EXCITING! Changing Candlelight to a 20 day event at Disneyland this year means there is a lot of uncertainty and YOU get to disburse the news. I’m sorry you are in such a position! If ever there was a case of “don’t shoot the messenger” this is it! I really appreciate the fact the seats are being provided gratis to pass holders. As a fan for over 40 years, however, my feelings are mixed about the change to a 20 day event. As a 2 day event that was not publicized it was really kind of special. I myself only “discovered” the event 10 years ago but have become a dedicated attendee. The expansion to 20 days is exciting because it presents so many opportunities for more people to see this wonderful event. Now comes the idea of a Sweepstakes?? As an out of state AP pass holder how do we plan time off from work, hotel and travel arrangements etc while waiting for a sweepstakes? What day do we get? How many guests can we bring? My guess is there are over a million AP’s vying for approximately 30,000 seats. The odds aren’t very good! I fear that in an attempt to do something nice for AP holders, problems may have been created. For what it’s worth I would like to see a limited number of dinning packages available for purchase starting in August that are open to everyone. You could bring in all of the restaurants in DTD to provide more dining choices and seating. The remaining ticket allocation could be made available to AP holders by lottery if you choose. I personally would prefer the “old way” of getting tickets. Trying for hours on line or by phone or queueing up in the wee hours of the morning at guest services or ???? to secure seats for a Disney event. At least that way, win or lose, those willing to make the effort knew they had a real chance to get seats! Kelly (and others), it appears that the lottery selection of AP’s will be for the premium seating in Town Square in front of where the main activities happen. I’m guessing that for those not having an “official seat” you will still be able to view the Procession and the rest of the show from the standing sections off to the side, just like it has been in the past. Kelly ~ What this means is the only way to get a seat to watch Candlelight from Dec. 3-20th is to get into the A.P. lottery. If you don’t have an A.P. on those dates, you can stand behind the seats with others who do not have a paid seat and watch from there. The only dates you can try to get a seat without an A.P. are Dec. 1 and Dec. 2 if you purchase an Ultimate Holiday Tour ticket. Wow. Really disappointing. I was ready to pony up some cash for a dining option. We have AP vouchers, however we will not be activating them until we arrive 12-15-12. Does that mean we are out of luck on this? I am sorry but i am alittle confused. Does this mean that non annual passholders cannot attend this event? Can you please shed some light? Thank you. It is unfortunate that the dining package – dinner and candlelight tickets- for this event are not available. Those packages were most enjoyable. You can’t reserve for your dining on “candlelight evening” when you don’t know what date you have “won”; if any ! Unfortunately, by the time we find out, I suspect that it will be to late, considering the Holiday demand. I have noticed you still offer dinner and ticket packages at Disney World – I guess California pass holders receive only a “chance” for second tier offerings. But after 4 years (?) of being left out, I guess it is better than nothing ! For all those commenters who think that they won’t be able to see CP at all, remember that the sweepstakes are for seated viewing. There should be plenty of SRO viewing from the area around Town Square. We’ve seen CP every year for the over a decade and always from a standing view. Those who don’t get seats should still be able to see CP this year. I’m going to Disneyland for the Christmas Season for the first time in 10 years, I was so excited to hear that the Candlelight processional was going to be extended through the season, and now because I’m not an annual passholder I don’t have the opportunity to really see it. Oh well thank goodness for Epcot and Walt Disney World. Thank you for the info. Not what we wanted, but Can’t expect to get every thing we want in life. I do really agree with Danielle’s post, Thank you..
Well said Danielle! I am an annual passholder and have been waiting since August for details as well. We even booked our air and hotel already and will be there! It is so disappointing to know that we may not “win” tickets – that was now we disclosed in the original post. If it had, we probably would have made different plans! Oh that is unfortunate. When this was first announced back in August, the blog mentioned that “A limited number of dining packages will also be available and will include reserved seating for selected performances – details and costs for these packages will be announced at a later date.” I’ve been following this blog for the past few months waiting for details and waiting to solidify my travel plans, and it is disappointing that after all this time people who are not annual passholders cannot attend. It would be most helpful in the future if this information could have been made available much earlier. I’m so sad to miss it and again disappointed that this it the outcome of all this waiting. Bummed for sure. We really thought the dining packages were going to be offered 🙁 I can now only hope that fate would look my way and I will be one of the sweepstake few. I live in northern California. I can only do a show Friday-Sunday (maybe Monday). Are you saying if the lottery chooses a Tuesday-Thursday I’m out of luck? I can’t take so much time out of the week to go down there. Wow really a sweepstakes, thats a big let down. So what we pick 3 days that we would like to go to and based upon that we might get the chance to see it. No dinner packages either, wow HUGE disappointment. At this point you should just make it first come first serve and standing room only. I’m so excited to hear this. Christmas and Disneyland is a win-win for me!